This gift was made by a donor whose family has a long history with Meredith, even establishing a scholarship fund in the early 1920s for tuition. The scholarship was permanently endowed 11 years ago by the anonymous donor so the family name would continue to live on and provide financial assistance to those who needed it. In 2011, the donor decided to revise its purpose and now this scholarship provides support for undergraduate students with financial need who are studying abroad. “I want to share my passion for travel by enabling future generations of students to experience the joy, intellectual stimulation, and excitement of exploring other countries and cultures,” said the donor in 2011. After visiting Sansepolcro and seeing the small community where students are living and learning, the donor created a new $1 million planned gift. “Studying abroad gives these young women confidence and it broadens their horizons. The curriculum is quite broad and the arts, architecture, and weekend trips teach them so much. It gives them a different perspective,” said the donor. Meredith has had a presence in Sansepolcro, Italy, for more than 25 years. In 2009, Meredith began leasing the 16th century Palazzo Alberti and the program has continued to grow. The donor also saw on her trips to Sansepolcro how wonderful the facility is and that it is truly a home for Meredith. The donor enjoys receiving the thank you letters from students who have received the family scholarship and was able to have lunch recently with four of the students to share in their experiences. 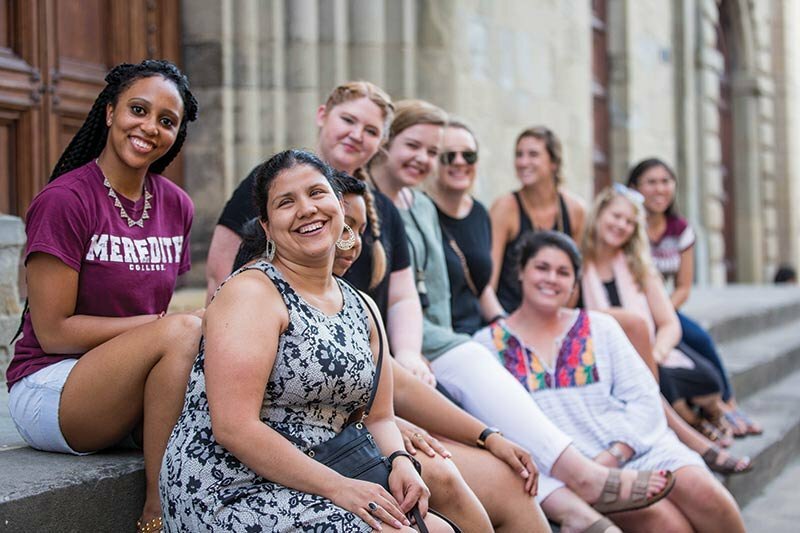 Ann Cox,’18, who studied in Sansepolcro in fall 2015, says the gifts to the program are vital because study abroad fees only cover so much of what makes the Meredith study abroad experience as magical as it is. “The benefits of this program are not all easily broken down into skills I can put on a resume. The simultaneous feelings of new-found independence and belonging in a new community all while receiving a Meredith education are irreplaceable. Gifts like these ensure that generations of students to come will be able to hone these skills and live these life-changing experiences,” said Cox. The Meredith community is excited about this gift, but no one more than Catherine Rodgers,’76, director of Meredith in Italy. “The gift from this generous donor will ensure that Meredith's program in Italy will continue to grow and thrive for years to come. We are grateful to them for acknowledging the importance of studying abroad and the unique nature of our program in Sansepolcro in such a special way,” said Rodgers. Learn more about study abroad and the Sansepolcro program at meredith.edu/study-abroad. Meredith College is pleased to announce other recent gifts for study abroad. A planned gift of more than $270,000 to support the greatest needs of study abroad.